It’s no secret that the cost of electricity in Australia is increasing. Electricity costs are on the rise! In fact, it’s hard to get a straight answer as to what the average cost of residential electricity is. The ACCC’s recent inquiry into the price of electricity is a great tool to help consumers to find out how much electricity actually costs in Australia. As well as the vast differences in retailer rates, their report showed that electricity prices depend on where you live in the country, including which city and state, as well as what time of day you use your electricity. Your quarterly electricity bill depends on the type of electricity plan you’re on, and the nature of the tariff (or pricing structure) that your plan falls under. On some plans, electricity is charged at both peak and off-peak rates. In Australia, electricity retailers often offer variations in their base cost per kilowatt hour. Off-peak rates are charged at less popular times of day, such as nighttime when electricity is less in demand, making them much cheaper. Peak rates are during the day and into the evening, when the majority of consumers use their power. The average cost of electricity in Australia has a number of variables, depending on the size of your home and how many appliances you use on a daily basis. However, the national average for electricity consumption in Australia is 6570 kWh per year or 18 kWh per day. Unfortunately, in the past three years, household electricity bills have risen by over $500. According to the annual performance report from the Essential Service Commission of South Australia, South Australian consumers also pay up to $68 per year to fund green energy initiatives. This includes the giveaway of home energy saving devices, as well as funding for solar panels to generate electricity for the grid and for the promotion of alternative energy resources. This report revealed that the average household electricity bill in South Australia has increased from $1165 to as much as $1680 in just three years. Consequently, residential electricity disconnections in South Australia have increased dramatically from 4,748 to 7,311 in 2011 alone. These disconnections are due to financial hardships among South Australians who are unable to pay their expensive monthly power bills. Fast-forward to today, and things aren’t much better. Australians are still paying too much for their electricity. 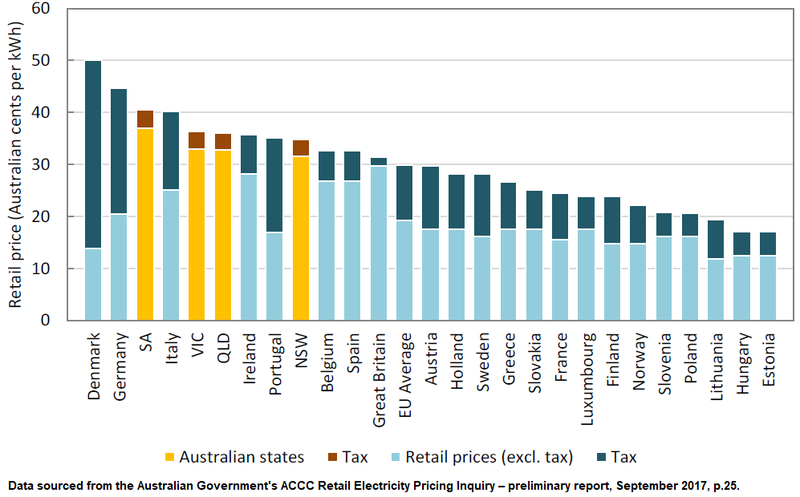 In a comparison of advertised residential electricity prices, South Australia, Victoria, Queensland, and New South Wales all rated poorly when compared to European countries. The Australian Energy Market Commission 2017 Electricity Price Trends Report states that the average annual electricity bill across Australia for the current year is up $100 from the previous year to $1576, with an average charge of 34.41 cents per kilowatt-hour – an average increase of 4 cents from the previous year. So across the board, the price of electricity is still increasing, and Government concessions still aren’t doing enough to help consumers fight rising utility costs. In June 2018, the ACCC said that “competition in bidding among rival generators is critical for driving efficient prices.” The best way to ensure an overall drop in electricity prices is for consumers to shop around and get the best deal. Regularly comparing retail electricity rates, and shopping around for the best deal, will see an overall decrease in electricity prices. Using the online electricity comparison services of Electricity Wizard will help you get the best price as well as help to drive market prices down. Luckily, most regions in Australia are experiencing full retail competition, meaning that consumers are able to choose the electricity company they want to supply them with electricity. This puts the power in your hands and lets you reduce the cost of your electricity bill. According to the Australian Government Department of Climate Change and Energy Efficiency, household water heaters are the single largest source of greenhouse gas emissions, and account for up to a quarter of the energy used per household. Roughly 50% of the 8 million households in Australia use electric water heaters. Electric water heaters create three times the greenhouse gas emissions of low emission water heating alternatives, such as heat pumps, solar power, and high-efficiency gas heaters. The Australian government is creating a plan to phase out the use of inefficient hot water heaters altogether. This will create an emission savings of 51.1 million tons of greenhouse gases within 10 years and will save homeowners a significant sum of money on their monthly power bills as they conserve energy by using heating alternatives. Start with the obvious, and make sure to turn off any lights when you’re not using them. Having lights on that you don’t need adds up to money down the drain. It’s a great habit to get into if you want to make long-term changes to your energy bill! Time to save on electricity costs! Another good habit to get into is turning any non-essential appliances off at the wall, instead of leaving them on standby mode. Appliances like your TV, the computer, the dryer or washing machine, your kettle and microwave, and even your phone charger all use power when they’re plugged in. Turning appliances off at the wall, or even unplugging unnecessary appliances, adds up to huge energy savings and a reduction in your quarterly bill. Depending on the tariff your home falls under, running high-powered appliances like your dishwasher or your washing machine later in the evening, or overnight, can see you take advantage of cheaper off-peak electricity rates, meaning you’ll be charged less for your use. So find out which hours your retailer considers to be off-peak, and use higher drain appliances during your off-peak hours. In Australia especially, water is a precious resource, so try and encourage everyone in your household to take shorter showers each morning. You’ll not just save water, but save on your heating energy costs at the same time. Four minutes is enough, so just set up a timer on your phone, and save on your energy bills. Take advantage of our beautiful Australian weather and dry your clothes outside instead of in the dryer. Drying just four loads of laundry outside per week, instead of using your dryer, has the potential to reduce your electricity bill by almost $150. Take a natural approach to cooling, and cool your home over summer using what nature has given us. Simply close your windows, blinds, and curtains during the day to keep out the worst of the sun’s heat, then open them up again when the sun starts to set, and let the cooler evening air in. It’s natural, and couldn’t be easier. Use your fan instead of switching on the air conditioner. Using the fan works out to be 80% cheaper to use than air con, and can help you save up to $200 a year on your power bill. That is a huge savings on your electricity costs! If you are tempted to switch on the air conditioner (and let’s admit it, who isn’t?) keep it between 23°C and 26°C. Leaving it at these temperatures stands to save you $80 on your electricity bill—and after all, your house doesn’t need to be a freezer. Every degree that you increase the temperature saves you around 10% of the cost of electricity that your air conditioner uses. As with the simple light switch tip, you don’t need to cool every room in the house. Cooling one room by closing any doors or windows helps you to be more efficient with your energy use, and uses much less electricity than cooling down the whole house. If you feel any cold draughts, find out where they’re coming from—a simple door snake can do wonders in keeping your room warm. If you’ve had your fridge for a while, check the seals around the door. They might be old and need replacing, which can make your fridge use more electricity unnecessarily. Replacing your seals helps to make your fridge more energy efficient, and as it’s one of your biggest energy users, it can help you save quite a bit on your bill by reducing your electricity costs. If you’re running two fridges, think about whether you actually need to. The average four-person Australian household can comfortably survive on one fridge alone, so do you really need that drinks fridge? Older fridges use anywhere from two to three times more electricity than newer, energy-efficient models, and running on only one fridge has the potential to save you up to an estimated $200 a year on your bill. Take a look at the rest of your appliances, as you might be using one that’s much bigger and has a greater energy consumption than you actually need. Downsizing to the right sized appliance, or upgrading to a more energy efficient model, can save you in the long run, and help you reduce your energy footprint. You can even take it to the next level and replace your regular light bulbs with energy-efficient alternatives. This can see you save up to 75% on the cost of lighting your home, which makes a huge difference to your power bill! Energy-efficient light bulbs last eight times longer than regular light bulbs and will reduce your total energy costs for the year dramatically. Using these tips not only helps you to reduce your cost of electricity but also helps you give back to the environment too. So why not try them today—what have you got to lose? Compare and you could save today! If you really want to start saving money on your electricity bills, there’s something you can do right now to fight the rising cost of electricity. Get in touch with ElectricityWizard. We can help you compare your current electricity plan with a range of retailers to help you find a retailer with a plan and a rate that suits you, and helps you keep your hard-earned money where it belongs. These days, homeowners have the freedom to compare electricity retailers and save even more money on their monthly power bill. Comparing providers will help you to get some of the most competitive electricity rates possible so you can enjoy massive savings on your home energy bill. It’s no secret that the cost of electricity in Australia is on the up and up—but that’s where we come in. We’ll help you compare apples to apples, and find a plan that’s right for you. That is the way you can save on your electricity costs today! It’s never been easier to compare energy providers than with ElectricityWizard. Call now on 1300 763 849 and speak to an energy specialist who will help you find a better deal to meet your needs.